Linear rail is assembled from perforated aluminum channel and a pair of 1/4" round rods, placed on square nuts and held by flat head screws. 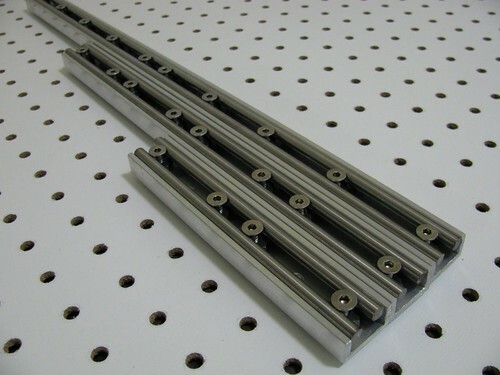 Linear bearings ride on the round rods providing low friction/no play alternative to sliding elements and angle. Linear rail comes in several lengths: 6", 12", 18", 24" etc. The rail can be attached in a number of ways to perforated angle, channel or T-slot profile. A pair of rails and at least a pair of linear bearings are needed to make a complete linear stage. Perforated aluminum channel is made in a way similar to that of perforated angle - by center punching with pegboard guide or template labels. Flat head screw, 10-24, 7/8"
Place the channel piece on the angle or channel where it will be attached. Place square nuts on every other hole, rotating them 45° into diamond shape. Place two pieces of rod of the same length on top of nuts and, holding them to the walls of the channel, drop flat head screws into the holes.